In America, where people pray every day to go just a little bit faster, Bonneville is the high temple of speed. Since 1935, when Englishman Sir Malcom Campbell broke the 300-miles-per-hour mark here, through the '60s, when Art Arfons and Craig Breedlove battled to break the sound barrier in jet-powered cars, speed freaks have made the pilgrimage to Bonneville to test their machines. The rules are simple: there aren't any. No limits on weight, engine or fuel. You just go as fast as you can. 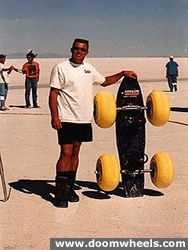 It was appropriate then, that Bob Childs chose the salt flats of Utah as the site for the first-ever Bonneville Buggy Enduro. Childs' goal: stage long races that would test the limits of current equipment and competitor's endurance. All races at the September event would be "open," that is, any wheeled vehicle and any kite traction method would be allowed to compete. The format was organized to provide competitors a venue where they could modify existing equipment, test new designs and compare their results. The event, Childs explained to invitees, would not be a kite festival but a serious competition intended to stretch the envelope of land-sailing skills and traction systems. Preparations were impeccable. Childs showed up early and took hourly wind readings for five days. 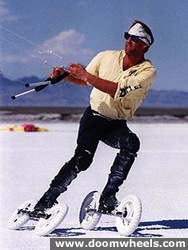 The race marshall was Troy Navarro, a kite traction pioneer who has been kite-sailing on water skis since the mid '80s. Navarro brought extensive technical and organizational experience. He also brought 4 one-piece "bubble tires" that may soon allow soft-sand buggying. 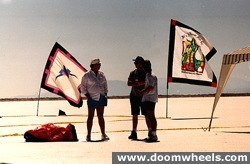 Frank Kenisky of the Southwest Stunt Kite League provided race support, registration and timekeeping. Mike Greenholz supplied the operations tent and his son Bret contributed what was to become the official slogan of the first annual Bonneville Buggy Enduro: "Push me!" On the morning of Saturday, September 10, the racecourse was laid out, a 2.5-mile trapezoidal track with two parallel crosswind legs and two shorter upwind and downwind legs. On Saturday afternoon the 30 registered racers sweat patiently as the wind refused to top 5 miles per hour. Finally, Jeff Cain lost patience and took to the salt with a 7.5-meter Peter Lynn Peel. Two hours and 45 minutes later he finished one lap. Obviously, there could be no official race, so a practice race was organized. This session proved that light wind is the domain of the 10-meter Peel, as Phillip McConnachie of New Zealand finished first and yours truly came in a distant second. 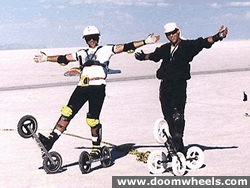 Third place went to Brian Vanderslice on his Terra-Blades, and in fourth was Cain, whose earlier practice paid off. After a wind lull of 30 minutes Chris Lamb finally finished behind a Modulus sail by Spider Kites, and a truck was dispatched to pick up the remaining stranded flyers. Sunday brought more of the same, only less of it. The course was rearranged to accommodate wind from two directions, but the breeze that had teased on Saturday didn't have the energy to even bother on Sunday. As the sun set, not a breath of wind showed in the marker banners. "There's a big dump at Bonneville that's been on fire for something like 10 years and the smoke is good for gauging the wind. But it was going nowhere. In fact, the smoke was blowing downhill, so I knew then that we had a high-pressure zone sitting right on top of us." The standards for kite traction that Childs hoped to set at Bonneville would have to wait. "Personally," he admits, "I was rather discouraged. But everyone else seems to be having a great time." Bearing that enthusiasm in mind, Childs says he will try again to establish speed and endurance yardsticks next March at Ivanpah, Nevada, or perhaps next September again at Bonneville. The goal, he explains, is not a speed record, but a record of speeds achieved by flyers under a given set of conditions, which would include wind speed, wind direction, a flyer's angle to the wind, etc. With this data in hand, Childs hopes to establish a formula that all traction kiters can use to compare performances. "Everybody's saying 'I did 40,' 'I did 50,'" Childs says. "We need bench marks of speed and mileage, based on the conditions at the time, so that somebody in the future can apply that same formula and find out if they're being more efficient, to find out how much speed they're getting out of a certain amount of wind. Anybody can do 20 miles an hour in a 30-mile-an-hour wind, but if you're doing 20 in a 15 you're a lot more efficient.